To Cite: Jamshidi K, Bagherifard A, Yahyazadeh H. Intraosseous ganglion of the medial condyle of the tibia: A case series of 7 patients, Shafa Ortho J. 2014 ; 1(2):e65. Background: Intraosseous ganglia (IG) are solitary, osteolytic lesion juxtaarticular in the epiphyses of long bones. The origin of articular cysts is controversial and is not recognized well. Methods: From 2006 to 2011 in Shafa Orthopedic Hospital we identified 7 cases with final diagnosis of intraosseous ganglion cyst in medial condyle of tibia. We surveyed their medical documents and images and after final visit described the pattern of presentation, radiologic feature, treatment and their outcome after treatment. Results: Of 7 patients, 6 were female and 1 was male. All had chief complaint of posteromedial knee palpable identified to be sub pes anserine bursa. 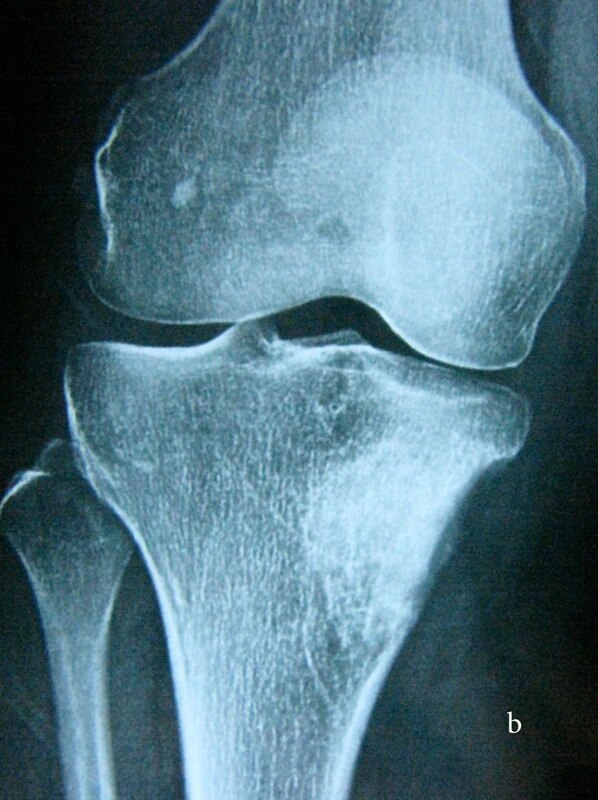 There were two evidence of moderate degenerative joint disease (DJD) in the knee joint. We found conduit between the cysts beneath or near the pes anserine and the ganglion cysts in the medial condyle of the tibia in all of the cases. After surgery, patients became symptoms free, and there was no evidence of recurrence in 25 months mean follow up. Conclusion: IGs of medial condyle of tibia are usually associated with soft tissue component. Considering the strength of cortex and resistance of bone trabeculation of medial condyle of tibia, it is more likely that the primary lesion originates in the bone and then will spread to the adjacent softtissue. 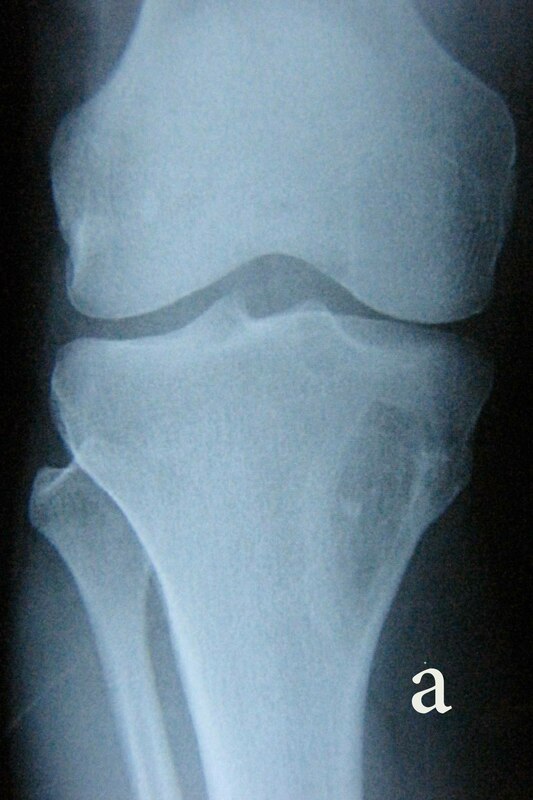 Many cystic lesions have been seen in and around the joint and may produce similar clinical presentation. Cysts, geodes, ganglia are appeared as a lucency in plain radiography and often applied interchangeably (1-4). 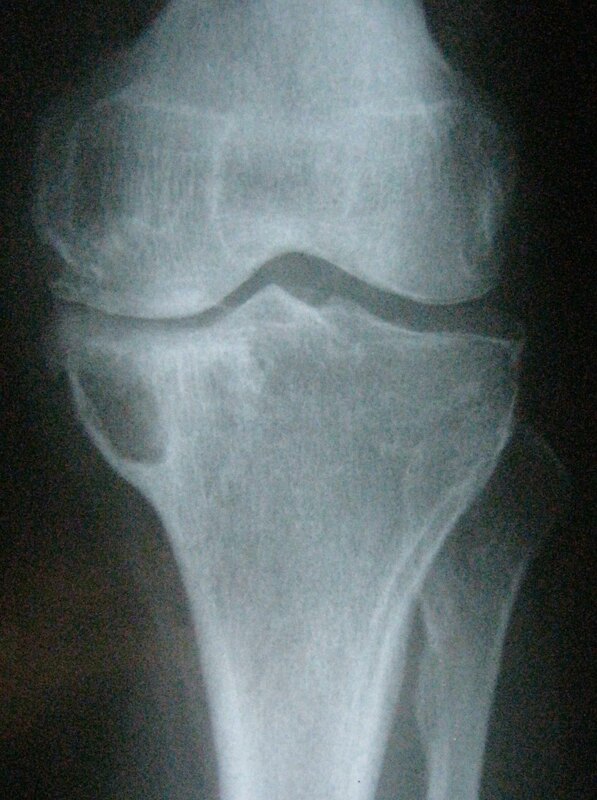 To the radiologist subchondral bone cyst indicates a radiolucent lesion beneath the articular surface and to the pathologist bone cyst implies a cavity lesion filled with fluid and has an epithelial lining. 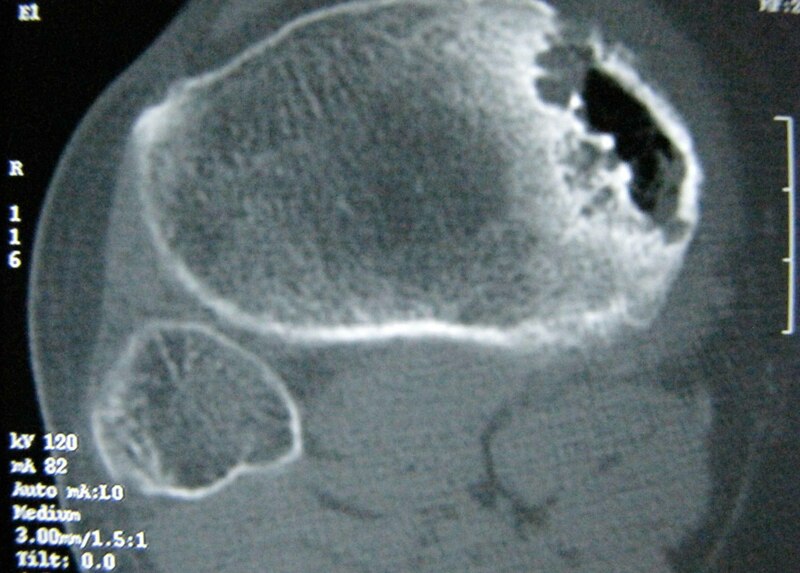 In Europe, the term geode is applied to all such subchondral lesion. In geology, geodes are small hallows in rocks. The term degenerative cyst, which used interchangeably with subchondral bone cyst is commonly multiple, segmental in distribution, and has surrounding sclerosis, and often identified in patients with osteoarthritis (5-7). Intraosseous ganglia (IG) are solitary, osteolytic lesion juxtaarticular in the epiphyses of long bones, and are histologically similar to ganglion cyst in the softtissue (8). They contain mucoid material and the cyst walls are composed of bland fibrous tissue with no specialized lining. The femoral head and the tibia have been shown to be commonly affected respectively (1-4). The origin of articular cysts is controversial and is not recognized well. As Schajowicz et al (4) state there are two types of IG (4). The first one is “primary” or “idiopathic” IG that arises in the bone. This may occur after bone intramedullary metaplasia or repeated trauma followed by fibroblast proliferation and mucoid degeneration, which resulted in cyst formation (4-9). The second form of IG is thought to arise extraosseously, stimulus by penetration of a soft tissue ganglion into the bone (4, 9-11). To the best of our knowledge, there is no report of IG in the specific location. We reviewed 7 patients with IG in medial condyle of tibial plateau soft tissue ganglion presented in all of them. We described the pattern of presentation, radiologic feature, treatment and their outcome after treatment. We believe this is the first case series report of IG in the specific area of the medial condyle of the tibia. The study was approved by our center institutional review board and after receiving required permissions we identified 7cases with the final diagnosis of IG of the medial condyle of the tibia operated during a 6-year period, from 2006 to 2011 in our hospital. We collected data from our medical records and reviewed and recorded demographic information and the signs and symptoms of the patients at presentation to our center as well as histopathology reports, radiographs and photographies from the archives of our center. All included cases had radiography of the proximal of the leg, CT scan of the involved area, MRI and 2 of them had Tc99 bones scan. Based on the imaging finding, we planned excisional biopsy. Surgical procedure in all patients was performed under general anesthesia, with application of a tourniquet to the proximal thigh. 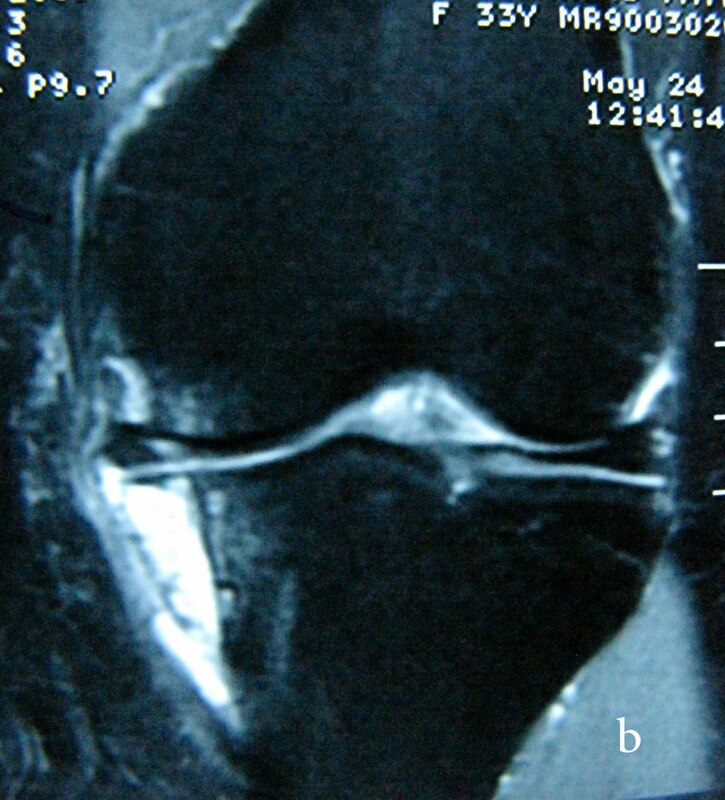 A direct longitudinal medial approach was chosen between pes anserinus and patellar tendon, and a large window was opened over the soft part of the cyst. In all of our cases there was sub pes anserine cyst that connected to IG. Curettage was performed and all content of the cyst was removed. The cavity was filled with fresh frozen allograft, which was obtained from our hospital bone bank. All cyst materials as well as the tissues were sent for pathologic examination. Then we followed the patients at least for 2 years and recorded our treatment results. The patients were informed that their data will be used in publication and we thus we obtained their written consents. We performed MRI in all patients. Accordingly, there was isointense lesion on T1- weighted images with respect to muscle. 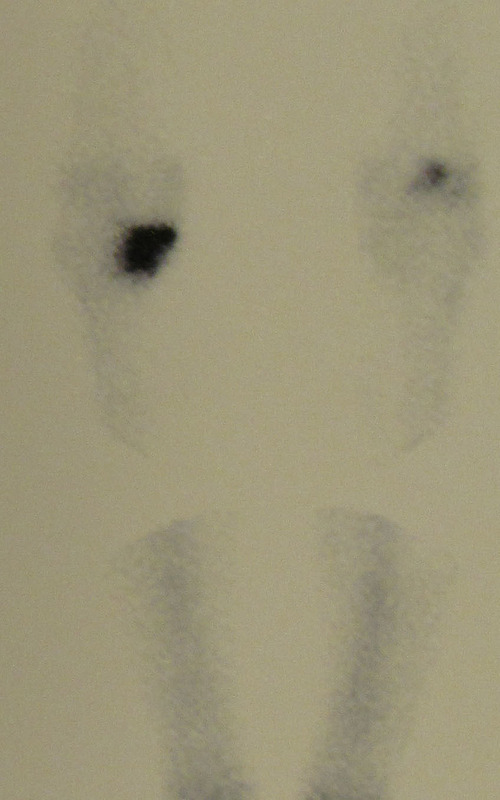 These lesions were hyperintense homogeneous mass on T2-weighted sequences. In all of our cases, there was connection between IG and soft tissue component of the cyst (Figure 3a,3a,3b). 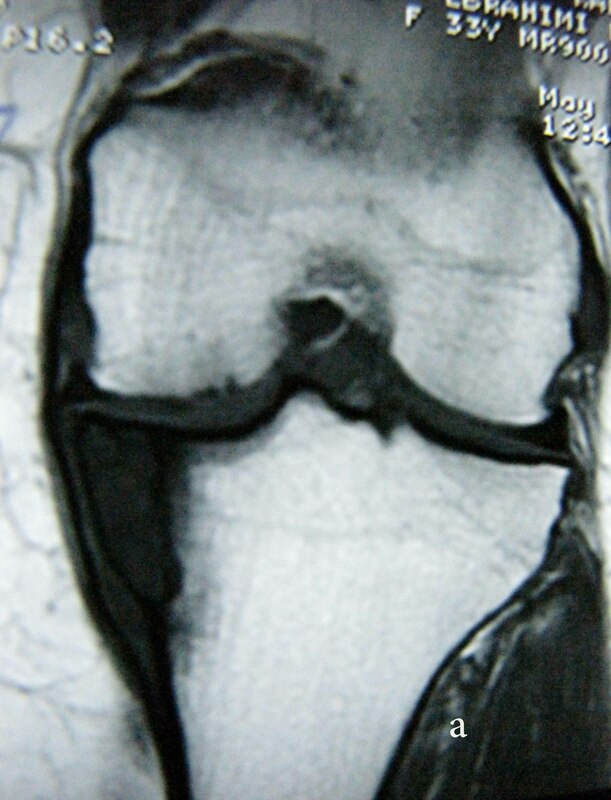 In CT-scan of knee joint we found abnormal density with lytic appearance at medial portion of tibial plateau with cortical disruption at some area, which cause to connection between the two part of IG and soft tissue component (Figure 4). In Tc-99 bones scan, which was performed in two our patients we just found slight activity increase in the tibial plateau (Figure 5). 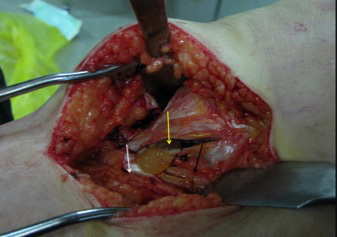 Intraoperatively, we found conduit between the cysts beneath or near the pes anserine and the ganglion cysts in the medial condyle of the tibia in all of the cases which were filled with a gelatinous fluid (Figure 6). Histopathologic results showed that the cyst wall had fibrosis and mild inflammatory cells in favor of ganglion cyst. IGs are solitary, unilocular, or multilocular cystic lesions in the epiphyses of long bones (6, 10). This lesion usually is seen in middle aged adults and often present with mild and localized pain or swelling (13). In previous reported series it was seen more in females than males (4, 8). Most of our cases were female (6 vs. 1), in the middle age (mean 43/8) and their chief complaint were palpable mass in anteromedial of knee and five of them had complaint of pain too. Intraosseous cyst without previous inflammatory or DJD are becoming better recognized during past years (6). The literature reflects that IG is an intraosseous cyst without associated degenerative change (9, 13, 14). In Williams et al (8) report there were evidence of DJD in 49% of patients. Six of our patients were female where we just found evidence of moderate knee DJD in two cases (28.5%). All of our patients had anteromedial swelling as main complaint, which was because of the soft tissue tumors identified intraoperatively in all of them (Figure 6). Kambolis et al. (11) reported ganglionic cysts of the bone developed by invasion of the ganglionlike connective tissue into the bone from the adjacent soft tissue. Schajowicz et al. (4) described that approximately 85% of the reported cases are of intraosseous origin related to altered mechanical stress leading to intramedullary vascular disturbance and aseptic necrosis. They attributed the etiology of the cystic formation in this type to revitalization of the necrotic areas by fibroblastic proliferation and subsequent mucoid degeneration. Despite of these accepted theories Williams and colleagues suggested that soft tissue ganglia are usually secondary to primary bone ganglion because the bone barrier is a strong resistance against the soft tissue migration into the adjacent bone (8). Whereas, Williams et al reported 38% of their cases associated with soft tissue mass component (8), we report it to be present in all of our cases (100%). During surgery we found soft tissue mass and a conduit between these two lesions in which both were filled with a gelatinous fluid. IG of medial condyle of tibia is not a rare lesion and has soft tissue component and more likely to be mistaken for a tumor. Considering the strength of cortex and resistance of bone trabeculation of medial condyle of tibia, it seems that the primary lesion originates in the bone and then spreads to the adjacent soft tissue. Curettage and bone grafting procedures provide relief of symptoms.